The PADI Search and Recovery Driver Course is for ages 12 Years and Older. 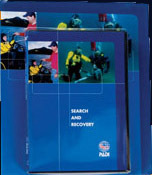 For your course you will need the PADI Search and Recovery Crewpak. If you purchase your PADI Search and Recovery Crewpak at the time you book your course. Each student is required to purchase from us their own PADI Search and recovery Crewpak. Get Your PADI Search and recovery Diver Certification Today. This course is designed to be an introduction to search and recovery diving and to help the student diver develop the necessary skills and knowledge for safe search and recovery diving. Over the years I have found so much stuff that my friends have nicknamed me Sir Find-a-lot. The PADI Search and Recovery Scuba Diver Course, teaches you how to set up search patterns to look for and find things under the water. Once you’ve found something we will teach you how to use underwater lift bags to bring it to the surface safely. Let’s go find some stuff! The purpose of the PADI Search and Recovery Diver Specialty course is to familiarize divers with the skills, knowledge, planning, organization, procedures, techniques, problems, hazards and fun of search and recovery diving. A. To develop the student’s practical knowledge of search and recovery diving. B. To enable the student to plan, organize, and make search and recovery dives. You begin the academics in the comfort of your own home. Once you sign up for the course, you will receive all the academic materials needed to complete the home study portion of your course. To start your course you will watch The PADI Search and Recovery Diver course video and complete your knowledge reviews in your PADI Search and Recovery Diver Manual. This will get you ready for Your classroom session and the in water training portion of your class.